Years ago, schools offered metal and wood shop. If you were lucky enough to have taken a shop class, you probably remember the excitement you experienced when you actually created something. With 3D printing, it is even more exciting. There are easy-to-use and free design tools available. With these tools and your imagination, your own designs come to life in the virtual computer world and then can be 3D printed into the real world. This is a 3 workshop series. Each session builds on the previous one. In each session, new design skills will be taught. Students will learn to use TinkerCAD, which is a free, internet based program. They will also be able to use TinkerCAD from home with any computer (MAC or PC), with an internet connection. 102 - Advanced TinkerCAD: Building on the basic skills from 101, Students will learn more about the capabilities of TinkerCAD, using multiple shapes, creating holes of all shapes, sizing and much more. The project will be to design a small house. Students will receive their customer 3D print from each session. 3D printing is very cool, but it is not fast. 3D prints will be available the following week. In addition, they will also receive a 3D print at the first session, a fish fossil that moves. The total cost for the all sessions workshop and includes all of the 3D prints is $50. 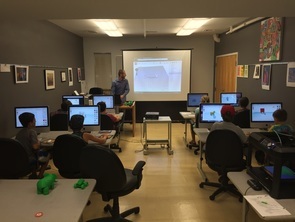 Art to Thing is a single session workshop where students will create an object using TinkerCAD, TinkerCAD, which is a free, internet based program. They will also be able to use TinkerCAD from home with any computer (MAC or PC), with an internet connection. The total cost for the single session is $25 which includes two 3D prints (one which they design and a fossil fish), 3D printing is very cool, but it is not fast. Their custom 3D print will be available the following week. In addition, they will also receive a 3D print to take home from this session -- a fish fossil that moves.